The Upper School course of study leading to graduation is given below. 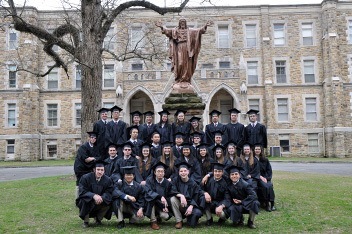 Preparing teenagers for college and university studies, St. Bernard awards its diploma based on the successful completion of courses and the accumulation of at least 24 credits. St. Bernard Freshmen, Sophomores and Juniors are expected to enroll in at least seven classes each semester. Seniors enroll in no fewer than six classes each semester. The policy of St. Bernard is that no courses are audited. To be eligible for graduation from SBP, a senior must earn a semester passing grade (at least 60) in each course (required or elective) in both semesters of the senior year. Passing a given course requires a semester average of at least 60 in that course. Barring extraordinary circumstances, final exams at SBP are final. They are given once, with no extra credit offered beyond the examination itself. An exam may not be re-taken for the purpose of passing a course, elevating a grade, or qualifying for graduation.